Putting out a CD of mostly cover tunes can be a risky move, especially if the songs chosen fall into the category of iconic, rock masterpieces. No matter if the band is a well-known, established act or a newcomer; the remakes will always be compared with the original, which can set a very high standard. The bar moves a bit higher with the decision to go all instrumental, leaving no place to hide musical mistakes or inabilities. As it turns out, Ron Brendle, Troy Conn and Chris Garges are a talented group of musicians who demonstrate their extraordinary musical ability by turning out an impressive collection of tunes. Schtuff We Like (LoNote, 2011) features seven cover tunes, including Zappa’s “King Kong”, “Space Oddity” by David Bowie, The Who’s “Boris the Spider” and “Lark’s Tongues in Aspic, Part Two” by King Crimson, as well as four original compositions. Apparently covering simple tunes like “Cat Scratch Fever” or “Smoke On The Water” wasn’t exciting enough for Bunky Moon. Instead, the band opted to attack some of the most complex compositions in rock history. Spoiler alert……………they did a damn good job. Guitarist Troy Conn must have taken considerable time to dissect “Lark’s Tongue in Aspic, Part Two” note-by-note, because I couldn’t find a single slip or bad note anywhere in the nearly eight minute running time. Conn also shows his ability to interject emotion and feeling throughout the CD, especially in Paul McCartney’s “Maybe I’m Amazed” and the Bunky Moon original “Sleep Talk”. He reminds me of a cross between Jeff Beck and Al Di Meola. I’ve known percussionist Chris Garges for a number of years and am continually amazed at his talent. Garges seems to have an ability to slip into nearly any style of music and play like it’s the only thing he knows. He also likes to step outside his Noble & Cooley drum kit to bang on other stuff, such as Korean temple bells, seed pods, squeaky toys, Pringle chip cans and aluminum foil. The addition of such an oddly-complete percussion element gives each tune a distinct personality. “Hypermobility” is a great example of Garges’ talent and ability. A lesser bassist could easily get lost in this band, but Ron Brendle manages to push through the fray and make an indelible impact on each song. Brendle’s smooth bass line in “King Kong” provides lots of solid ground for Troy Conn to play on and even steals the listener’s attention on occasion. My favorite Brendle track is Bunky Moon original “Mealy Mouth”. Composed by Brendle, “Mealy Mouth” is the kind of tune that makes you move without realizing it. The dominate bass line is definitely the star of this song, pushing Conn’s lead work into a support position. Schtuff We Like was recorded at Old House Recording Studio in Charlotte, North Carolina and mixed by legendary producer Mitch Easter at Fidelitorium Recordings in Kernersville, North Carolina. 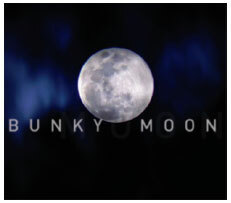 Bunky Moon is amazing! Incredible musicianship and tones, well executed covers, and awesome originals – this is a great record!